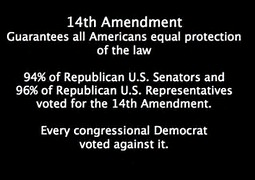 Subtitle: The Wisdom of the 14th Amendment. After a quick look at Section 1, this squib takes a closer read of Sections 2 & 3 of the 14th Amendment. We’ll find that, as opposed to recent times, Congress expected itself, and not federal courts to sort out and deal with difficult issues. In the latter 1860s that meant incorporating former slaves into the civil society. In the hands of the far Left, an amendment designed to deal with post-Civil War realities is the modern Progressive’s favorite means to social justice. From a hopeless mash of conflicting decisions, Scotus determined, for instance, that the equal protection clause of Section 1 prevents states from denying welfare benefits, or state civil service jobs to legal alien residents. On the other hand, states may deny legal aliens jobs in law enforcement and teaching at public schools. In 1982, Plyer v. Doe practically invited the flood of illegals we endure to this day when Scotus burdened citizens with the K-12 education of illegal alien children. As Mark Levin warned, when the equal protection clause is taken to its social justice conclusion, we are one court decision away from granting everyone, anyone who happens to be in the US, the right to vote. Argumentum ad absurdum. But, along the way of researching this series, I found there is much more to the 14th Amendment than the much-abused Section 1, which granted citizenship and attendant civil rights to former slaves. Section 2 of the 14th Amendment was the first explicit recognition of a political (not civil) right to vote. In Sections 2 & 3 are two wise, if not remarkable amendments. 2. When the right to vote at any election for the choice of electors for President and Vice-President of the United States, Representatives in Congress, the Executive and Judicial officers of a State, or the members of the Legislature thereof, is denied to any of the male inhabitants of such State, being twenty-one years of age, and citizens of the United States, or in any way abridged, except for participation in rebellion, or other crime, the basis of representation therein shall be reduced in the proportion which the number of such male citizens shall bear to the whole number of male citizens twenty-one years of age in such State. Should a state deny or abridge the right of a male citizen over twenty-one years of age to vote in legislative, executive, or judicial federal or state elections, Congress SHALL cut the state’s representation in Congress in proportion to the numbers of men denied the franchise. This approach to deal with the denial of the political fruits of citizenship to the black man was in keeping with the Framers’ approach to good government. Rather than rely on military force or judicial decrees, the Framers of 1787 and the penmen of the 14th Amendment in 1868 relied first on structural checks, on political solutions to practical problems. The 14th Amendment did not remove Article 1 § 2 from the Constitution; the states were still responsible for crafting voter qualifications, but political punishment awaited states for denying the franchise to any (non-criminal or non-rebellious) twenty-one-year-old man. Rather than rely on unelected judges to impose locally unpopular court orders that were certain to be met with violent resistance, Section 2 provided peaceful means to punish states for disenfranchising black men. Brilliant! Many members of Congress accepted the jurisprudence of the day, in which the rights of man fell into three categories: natural, civil, and political. The privileges of citizens, being “civil” rights, were distinct from the rights arising from governmental organization, which were political in character. The only sensible explanation of § 2, therefore, is that the racial voter qualifications it was designed to penalize were understood to be permitted by § 1 of the Fourteenth Amendment. As a pre-condition for rejoining the Union, southern state legislatures had to ratify the 14th Amendment and incorporate it into their state constitutions. From Justice Harlan’s study of the 14th Amendment, all the subsequent scotus decisions on the franchise which relied on Section 1 were in error. Section 1 dealt with civil rights. Section 2 dealt with political rights, and the consequence for denial of the franchise to blacks was diminution in congressional and electoral college representation. There is, of course, much more in subsequent laws such as the 1875 Civil Rights Act and civil rights court cases through Reconstruction, which are far too complex to begin to address here in a short squib. But, as we know, Congress never reduced the congressional representation of any state that denied, through various subterfuges, the franchise to adult black men. Notwithstanding Section 5 which granted Congress the power to enforce the 14th Amendment, I view Section 2 as a reminder, a reminder of a time when Congress expected itself to deal with disputes and difficulties, rather than, as it does today, punt as much as it can to social justice federal courts. Rather than round up ex-confederates and try and execute thousands for treason, Congress simply took means to prevent them from stirring up trouble again. Yes, the war turned southern society upside down; Section 3 of the 14th Amendment banned the south’s natural aristocracy from government, while the 15th Amendment enfranchised ex-slaves. In sections 2 & 3 of the 14th Amendment, Congress devised political solutions to practical problems. It didn’t design vague clauses for executive branch administrators or Scotus to sort out. We could use a lot more clarity of purpose, like that of the second and third Sections of the 14th Amendment, today. A prerequisite for clarity in the law is prudence. A prudent legislator ignores short-term popularity and the electoral advantage a law may bring. Instead, he estimates the long-term consequences of the law on society. Popularly elected bodies are rarely, if ever, prudent, and without prudence, clarity of purpose in the law is impossible. In masterpieces like the 14th Amendment, Congress exercised prudence and clarity of purpose only surpassed by the Framers in 1787. Without return to prudential government made possible by repeal of the 17th Amendment, the remains of our diminishing republic can expect more monstrosities in the law like the Affordable Healthcare Act, and rule by an oligarchy of nine, the Scotus. We are the many; our oppressors are the few. Government is the playground of politicians, but the Constitution is ours. Be proactive. Restore the American Tradition. Join Convention of States.